Holistic attribution—that is, attribution that factors in all company touchpoints, not just marketing’s—is the gold standard for companies hoping to understand what each of those touchpoints is actually worth, to both their customers and their business as a whole. It may be the gold standard, but today fewer than 5% of all companies are putting holistic attribution into practice. While by no means an easy transition, it is an essential one for companies hoping to adapt to a world where customers are increasingly put first. 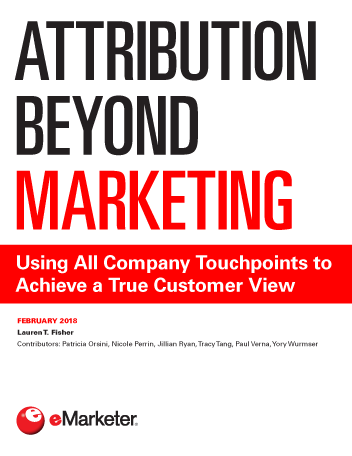 Attribution beyond marketing requires companies to incorporate various other customer-facing touchpoints for a true 360-degree customer view. Such touchpoints include call centers, sales forces, merchandising efforts and the in-store experience. To raise the chances of holistic attribution success, managers need organizational buy-in and a willingness to align to companywide key performance indicators (KPIs). They must also be ready to share the work required to put this advanced form of attribution into practice. "Attribution remains a major priority for US marketing professionals. Almost two-thirds said their company increased its prioritization of marketing attribution in the past year, according to a June 2017 survey conducted by the Data & Marketing Association (DMA) and Winterberry Group."